The VI's #1 Entertainment Experience!! After a year hiatus, Paid 4 Entertainment returns to heralds the summer with a Virgin Islands institution, the VI Summer Splash. The third affair offers a superior selection of Mainstream, Caribbean and Virgin Islands Entertainment to the Virgin Islands as well as the Entire Eastern Caribbean. 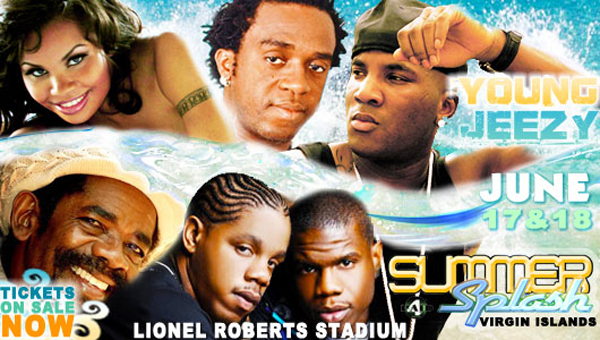 Judging by the record crowds at Lionel Roberts Stadium 2008, 2009; this year’s Splash is set to break all records with more excited patrons and explosive performances. This year's lineup is power packed and promises another Grand scale Experience with heavy hitters like DefJam Recording Artist Young Jeezy, "the SnowMan.” Witness on stage Living Legends of Reggae Music; Cocoa Tea & Little Hero. International Recording Artists & VI HomeTown Heroes; ROCK CITY and International Trinidadian Soca Star. This year’s “Ladies of Summer Splash,” includes BadGyal Ce’Cile, Dancehall Diva Spice, the Virgin Islands’ Favorite Soca Starlet Rudy, and the Soca Diva. Plus performing live Mr.Energy PUMPA!, BV & Drastic, DeH FAM, & Rafijah Siano. Of course there will be much more performances on hand over the duration of this event, all in one place; Friday & Saturday, June 17 & 18 at the Lionel Roberts Stadium. 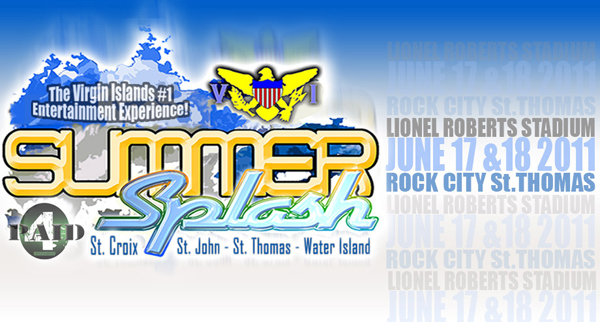 We invite all to the Third Annual Summer Splash Experience, taking place June 17th & 18th, 2011 at Lionel Roberts Stadium, St. Thomas. Be part of History as the Virgin Islands Summer Splash brings together the Biggest Names in Dancehall, Reggae, Soca, and the Best and Brightest of Virgin Islands Talent. Paid 4 Entertainment would like to thank all our Major Sponsors & our TITLE SPONSOR, THE USVI DEPARTMENT OF TOURISM, Paid 4 Friends and Family, and everyone else who makes VI Summer Splash possible. It is not an Event it's an Experience!! !